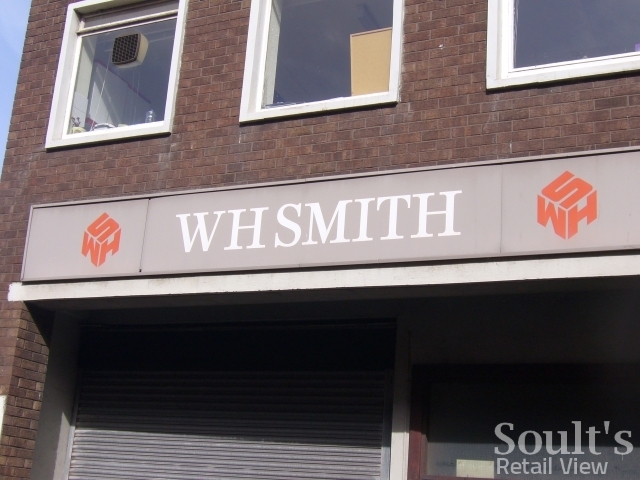 Visiting Redcar today, I was amused to spot a little throwback to the past in the form of an old WHSmith fascia, featuring the once familiar cube of ‘W’, ‘H’ and ‘S’ letters. Curiously, the main frontage of the store in Redcar High Street features the more up-to-date blue fascia with white text (below), but someone has either forgotten to update the goods entrance or decided that it really isn’t terribly important. It must be about a decade since I last saw the old logo featured on a WHSmith store, though – I remember it being on the old Eldon Square branch in Newcastle, before that closed and business moved to the shiny new branch on the old Littlewoods site in Northumberland Street. Needless to say, readers, it would be fun to hear of any other places that you know of where the former logo is still in situ. It is interesting, though, how a logo that looks fairly innocuous at the point of being retired begins to look rather quaint and dated once you’ve got so used to its replacement. Redcar aside, however, WHSmith seems to have done a pretty good job of rolling its new logo out over the years – and that is important. If you’re a retailer going for a new visual identity, with all the brand values and sense of change that that espouses, it needs to be comprehensively and consistently applied – as House of Fraser has recently done. In contrast, retailers such as Matalan, Next and M&S have all been rather slow at applying their new visual identities to existing stores; the risk is that it creates and communicates a two-tier estate – those most important stores that are evidently worthy of rebranding; and those lower in the pecking order that seemingly aren’t so worth investing in. Next story How many former Woolworths can Graham visit in one day? I’ve just found an old dry transfer lettering sheet that has this old logo on it! I have no idea how old it is. How can I send/upload a photo? My mate’s dad, Ian Middleton, designed the WHS cube. I remember him showing me the early sketches in the 70s. Great stuff, Alex! Did you see my recent blogs about retail in Swindon? http://www.soultsretailview.co.uk/2011/09/15/swindons-former-woolworths-store-past-present-and-an-uncertain-future/ and http://www.soultsretailview.co.uk/2011/09/15/swindons-bhs-provides-a-taster-of-what-newcastle-and-hartlepool-can-expect/. The WHS in Nottingham Train Station still wears the cube logo (albeit sans ‘S’ – as if they tried to get rid of it and found it far too much of a faff!). I think the new one looks really posh and bland. With the knocking down of the old ‘Pig n’ Whistle’,’Mikes’s Cafe’ and what I think was an independent video shop (very rare nowadays) this old WHSmith’s logo is more visible. I quite like the old logo really as there newer one seems to simply ape Waterstone’s. Next door to this old logo in ‘Redcar Literacy Club’ if you look in the upper windows there’s currently a rather humorous sign which reads ‘Reeding Club’…. Really, aside from the lack of punctuation and capitalisation in the name – Mummy what’s a “Whsmith”? – then I loved the warm earthy colours of the old version. It is strange seeing this logo now, the colours are just unattractive. The new look is certainly more desirable. I suppose this is just because we have become so used to seeing this new form. 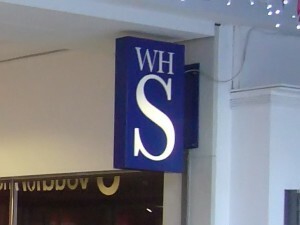 The WHSmith store in Swansea has the old logo imprinted on the glass of the windows.